Remote work is a game changer for businesses. It gives them access to the world's top talent, results in higher employee productivity, and saves them money. But because it's such a unique way of working, its challenges, too, are unique. All remote work setups — whether they are made of teams working remotely from different offices or of employees working from their homes or even a mix of both — face very specific challenges that need to be addressed. In this article, we look at 3 challenges that every remote team faces and how you can address them in your remote team. Dr. Karen Sobel-Lojeski, an Assistant Professor in the Department of Technology and Society at Stony Brook University, describes virtual distance as a sense of psychological and emotional detachment that begins to grow unconsciously when most encounters/experiences are mediated by screens/technology. The virtual distance model is made up of three factors: affinity distance, physical distance, and operational distance. Affinity virtual distance is the distance that people from different cultural sensibilities face when communicating and interpreting messages (among other things). In remote teams, which are often multicultural, affinity virtual distance is the most damaging because cultural differences between team members can cause gaps in communication. Ricardo Fernandez manages a remote team of 30 people from 10 different nationalities at Prodigy Finance. He recalls how one of his teammates from South Africa told him, "I'll call you just now." When his coworker didn't call in the next 15 minutes, Fernandez checked in with him. This coworker repeated that he'd make the call "just now". 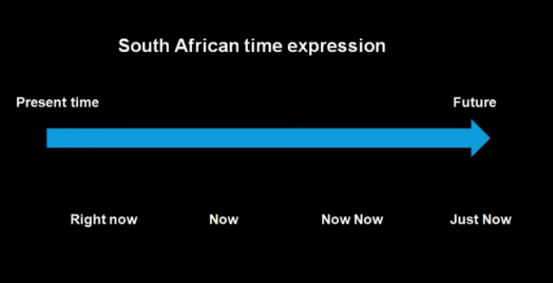 But this time, he sent Fernandez a graphic of what “just now” meant for South Africans. So “just now” for Fernandez’s coworker might've meant any time or day in the future (maybe that day, maybe the next?) — definitely not just "now” as most of us would understand. Now, if this person were to give a demo to a client using the same convention, you can imagine how an innocent communication gap could’ve cost the company a contract! Physical virtual distance, as the name suggests, is the distance between the physical locations of remote employees and their time zones. This doesn't necessarily represent a challenge, thanks to tools like Flock that enable both async and real-time communication for remote teams. Operational virtual distance concerns the logistics of remote work such as the number of team members, the degree of collaboration needed on projects, the different competencies/skills of team members and more. Again, issue tracking and project management tools like Jira and Trello can help remote team managers minimize operational virtual distance. To tackle the affinity virtual distance, educate your team on how to succeed in a multicultural environment. Make them "aware" that what they're saying might not be instantly clear to the people they're talking to. Encourage them to ask questions if something isn't clear. For Fernandez, the easy solution was to share a book called The Culture Map. Get everyone on board with your communication policy and request team members to share their availability with each other. This will help bridge the physical virtual distance. Find the best communication and collaboration tools and train your employees to use them. This can be very helpful in handling both physical and operational distances. Nearly everyone can admit to feeling distracted while at work. While distractions in a traditional office setup (chatty coworkers or the general office noise) can be different from the distractions remote workers face (think kids, cats, and everything in between!) — the result is the same: low productivity. This distraction problem can actually be much worse in a remote team as on top of everything else, it comes with a barrage of work updates happening on all the different tools — incoming emails, chat notifications, workflow app alerts, calendar invites and whatnot. Then, of course, there's Netflix, too. Distractions are, in fact, one of the top 3 struggles of remote workers. When Ctrip, China's largest travel agency, conducted a 9-month long experiment to test a work from home policy, they found that productivity increased by 13%. The interesting part? Employees working from home followed the same general routine that they used to in the office! A routine helps protect your time from everything you shouldn't be using it for, and it is a great defense against distractions. So encourage your remote employees to create and follow a routine. 7 out of 10 employees think that training can help people get better at blocking out distractions and achieving focus. Invest in training to make your employees aware of their distractions and give them the tools they need to overcome them. Encouraging your remote employees to create a home office is another great way to minimize distractions. With your support, they will be able to find the most "distraction-free' zone of their homes and work from there. Many remote-first companies like Buffer offer a home setup allowance. Working remotely also means working mostly alone. This social isolation might cause some of your team members to feel lonely or demotivated. These adverse health effects aren't just horrible for your employees but also for your business as unhappy employees aren't very productive. Besides, you want your employees to be their healthiest and happiest. One easy way to tackle the loneliness part of remote working is to encourage your employees to work from co-working spaces. These spaces can give your remote employees a sense of community and belonging that they might miss when working remotely. In fact, employees that visit co-working spaces report a much higher "thriving score" at an average of 6 on a 7-point scale. Arranging informal chats between your team members is another great way to beat this remote work "loneliness." Companies like Zapier and Buffer routinely arrange 10-15 minute buddy calls that give their remote employees some invaluable face-time with each other and help them feel more connected. Acknowledging and opening up about the psychological impact of remote working is the first step toward overcoming this challenge. Encourage your employees to talk about it. The remote team at Doist doesn't just talk about it openly, they also encourage employees to take sick days if they aren't feeling well (mentally). Vacations are great at reducing stress, improving focus, and achieving a great work-life balance. In short, you need your employees to take time off to do great work. Remote companies that understand that vacations improve the mental health of their employees offer lots of paid leaves. Some even go as far as incentivizing employees to take vacations! 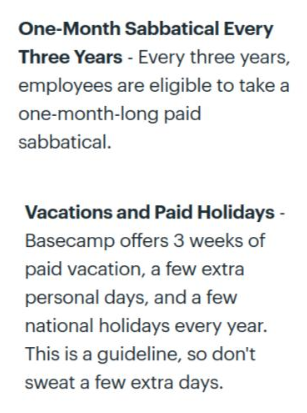 Basecamp, for instance, offers a one-month sabbatical every three years along with a bunch of other paid days off every year. Remote work comes with its own challenges. But even little things such as sharing a good book on cultural expressions, giving a one-time home-office setup allowance, or offering paid leaves (and encouraging your employees to take them) can make a huge difference to how your remote team performs. Proactively addressing your remote team's challenges helps you build a happy, healthy, and productive workforce that grows your business.